Rowdy Mermaid is a small kombucha brewing company based out of Boulder, Colorado. With five regularly bottled flavors, and then varying flavors on tap, Rowdy Mermaid offers its customers a great variety of choices to choose from. Although, the thing that is most intriguing about this kombucha is that they utilize Colorado snowmelt as one of the main ingredients to their product. Snowmelt is surface runoff produced my melting snow. Living Ginger: filtered Colorado snowmelt, 3x organic ginger, organic farm-sourced tea, organic cane sugar, kombucha starter culture, wildcrafted chaga, tasmanian pepperberry, pink himalayan salt crystals. Flower Grow: filtered Colorado snowmelt, organic fair trade certified green rooibos, organic cane sugar, organic rose petals, organic chamomile, organic chrysanthemums. Deep Forest: filtered Colorado snowmelt, organic farm-sourced tea, organic cane sugar, organic reishi mushroom, organic sassafras, organic madagascar vanilla. Cherry Kom Pow: filtered Colorado snowmelt, organic farm-sourced tea, organic cane sugar, black cherry juice, organic mint, organic garden hyssop. Morning Dew: filtered Colorado snowmelt, organic farm-sourced green tea, organic cane sugar, cold-pressed honeydew melon, organic violets. Jamba, Founder and Owner of Rowdy Mermaid, sent me two new flavors that are currently on tap in their brew house in Colorado. I loved these unique flavors, especially the Guava Basil kombucha! Throw basil into any drink and you've got me thinking it's a delicious summer cocktail. So the added fact that it is healthy for you is only an added bonus. Now that I have tried this product, I am sad that it is only currently available in Colorado (see locations here). 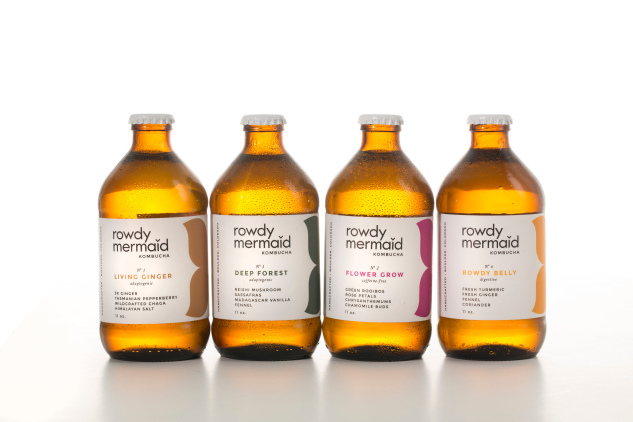 Their goal is to begin selling Rowdy Mermaid on the West Coast by Summer 2015. I am thrilled to have been introduced to this company and am so excited to see where their journey takes them. If you live in Colorado, or are visiting, this is an absolute must to check out!